First things first… What an amazing event, the atmosphere was fantastic! 44 women entered that’s the most I’ve ever seen in any race I’ve done. When we ride enduros they are lucky to get 10 women, 44 is awesome! It was friendly, well organised, perfect for your first race, spot on coffee shop… could you really ask for much else? Emma and I are from uupp norrffff so we decided to get a few days riding in and make a mini MTB break, we arrived late on Wednesday evening ready for riding Thursday. Thursday consisted of a few loops of the skills area, and a trip to Wagamama’s… it was raining… honest!!! Friday we set to it by asking if we could take my trail doggie Dexi on the uplift, surprisingly he was allowed so that set the lazy pace for the day. A track walk and few runs down Sheepskull were complete. Saturday I road the blue/red with Mark from MTB Instruction and Rachel Jev’s the minor MTB celeb finishing off with a run down Sheepskull with Mark. Race day we were kitted up in lush DHaRCO jerseys and defo looked the part (that’s the important bit!). We walked up for a practice run and I was feeling confident and happy about my bike set up and lines. I had a little fall on the lower section but nothing too bad. 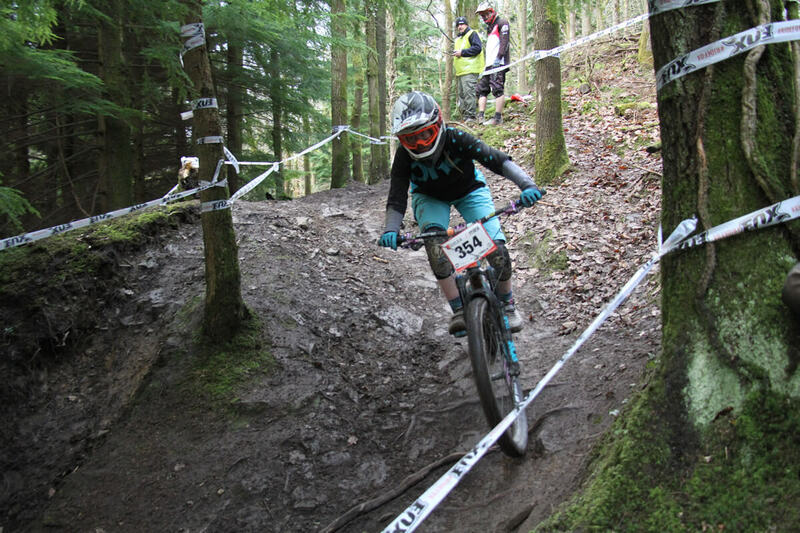 Run 1 – As we had never raced a downhill event or raced Forest of Dean before I lined up in order. I had a cracking top section hitting the line I wanted through the roots and things were going well. Unfortunately I caught the girl in front on the single track so I waited behind until she let me pass. I wasn’t mega happy but it was OK for a first run! Run 2 – Seeded on our first run I set off again feeling confident. Just my luck I caught the girl in front and it was impossible for me to pass her so I stayed a safe distance behind. I rode well and was happy with my riding, the rest is down to racing and that’s how it goes sometimes! And I looked awesome as my Flow kit and bike matched!